Vodafone TV - Is this sky? Forums › Sky, Neon › Vodafone TV - Is this sky? What about the on demand part? Is that SD same as MySky box's. If so then nothing new at all. Not sure abut the apps TVNZ on demand etc. I don't think broadcasters will go out of their way to have apps written for yet ANOTHER device. I expect it might use the android version of the apps? interesting enough, it is only for those people that has fibre available? what about those majority of us that has VDSL only? so we can't use this service then! Does this new bundle actually make Sky Basic cheaper than $50? 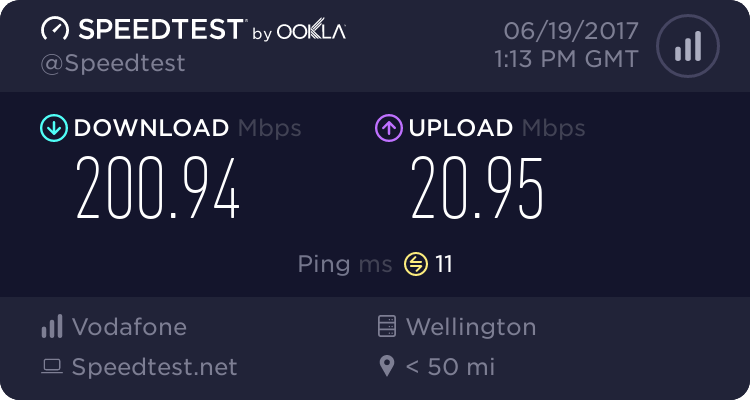 I don't know what Vodafones intentions are long term but I've managed to have this box working quite nicely on 20mb after playing around with the rgw's speed limiters. Time will tell but a very nice piece of equipment to use. As I'm part of the testing stage, I have available all the Sky channels, basic, sports,movies,Soho etc. Netflix works nicely with my own account and much quicker to access. There is still a bit to do in the background which I can't elabarate on sorry. Unless they removed the sport subsidy, I doubt it. Id expect say a $10 discount. Fellet mentioned added value recently, and apps on the STB, and especially untethering your TV from the Sky STB so you can use your other devices for all STB content is a big deal IMHO. Fibre is now available to the majority of NZ premises. No it won't work over VDSL2 as it relies on UFB multicast for the delivery of broadcast channels. "Hours of storgae". How hard is it to run a spellcheck before publishing? Edit 2: It seems that someone from Voda is reading this, because they've been fixed. Yes, this is what would concern me also. FibreX has been around for a while now and it's a pity that there are still reports of regular dropouts. There is also the point that if a large number of people switch from satellite to internet for all their TV viewing, will this place a huge load on internet and lead to even more dropouts? Imagine watching an All Blacks test match and having large chunks of the game dropping out due to internet overloading! Until there are answers to these questions, I think many people will prefer to stick with the SKY satellite service. Incidentally, will the Vodafone internet TV be in high definition as part of the basic price, or is it likely to cost more for high definition? What about 4K, will this be possible? Are these the last twitches of a dying beast? Unless they become a lot more competitive on price I don't see how this will make the sky package more desirable, .... and if Amazon gets the rugby, well, all over red rover. They need to at least halve their prices to be competitive with the likes of Netflix. The only thing that makes sky desirable is the sport. Will you be able to sideload other apps? If I could put kodi on there I would almost be down to one remote on the coffee table. So, Sky aside, as far as recordings and season passes etc go, how does it compare to a Tivo? Lipstick on a pig, me thinks. Definitely added value here for Sky subscribers - instead of paying high prices for poor service and outdated hardware, they'll now just be paying high prices for the poor service. Nay, I wish them well, but there's no point in looking out to the world with rose tinted spectacles; better that they know the truth. If they are not competitive they'll be gone in a few years. I seem to remember from the dark days of mathematics something about using simultaneous equations to find the optimum price point, where demand, price and sales volume are optimized for maximum profit. They need to do some analysis like that to keep themselves competitive. If they keep bleeding customers, then the end will come at some point.